Background: Polygonum odoratum is an indigenous vegetable that has been used as a favoring agent and also used as a Thai traditional medicine to treat flatulence. Objective: To analyze active ingredients, total phenolic and total flavonoid contents, antiinflammatory and antioxidant activities from leaf and stem extracts of P. odoratum. 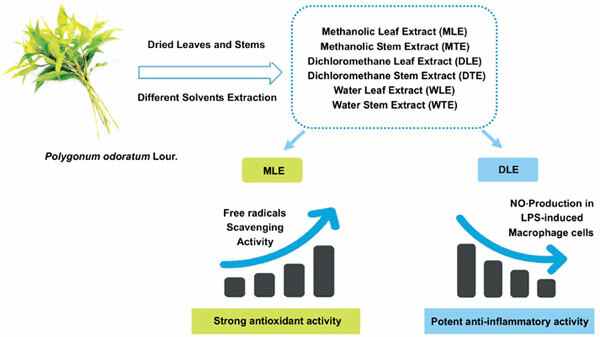 Methods: Leaves and stems were dried and extracted by using methanol, dichloromethane and water for obtaining Methanolic Leaf Extract (MLE), Methanolic Stem Extract (MTE), Dichloromethane Leaf Extract (DLE), Dichloromethane Stem Extract (DTE), Water Leaf Extract (WLE) and Water Stem Extract (WTE). The extracts were quantified for total phenolic and total flavonoid contents by spectrophotometry and active compounds were analyzed by using GC-MS. Antioxidant activity was determined by ABTS and DPPH radicals scavenging assays. Anti-inflammatory activity was tested by the inhibition of nitric oxide production in RAW 264.7 macrophage cells induced by lipopolysaccharide. Results: The DLE exhibited the most potent anti-inflammatory effect by inhibiting nitric oxide production in a concentration-dependent manner (IC50 = 53.75±0.72 µg/mL). MLE exhibited strong antioxidant activity and contained the highest concentration of phenolic compounds (52.59±0.58 mg gallic acid equivalent/g extract) and flavonoid (19.97+0.11 mg quercetin equivalent/g extract). E-15-Heptadecenal and 3, 7, 11, 15-tetramethyl-2- hexadecen-1-ol were found predominantly in the methanol extracts. Conclusion: The leaf extract of P. odoratum showed potent anti-inflammatory and antioxidant activities, mediated by DLE and MLE, respectively. Anti-inflammation, antioxidant, macrophage, nitric oxide, Polygonum odoratum, phenolic compounds.